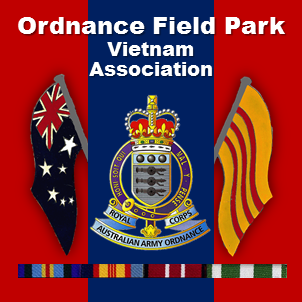 2003 – Alice Springs NT – Ordnance Field Park Vietnam Assn. WODONGA ’99 – GREAT! GOLD COAST 2000 – TERRIFIC!! ALICE SPRINGS 2003 – FAN-BLOODY-TASTIC!!! Our numbers may have been down (37 Vets plus their wives and partners making 73 in all), but we are sure all of those who attended will testify to the fact that the Alice Reunion ran like clockwork and everyone had an absolutely great time. The reunion activities officially started at the Red Centre Resort on Friday 25th April and concluded on Sunday night 27th April 2003. Many people started arriving during the week before the reunion commenced to take advantage of tours to Ayres Rock (Uluru) and other places of interest. Thursday 24th ushered in the arrival of the rest of the group at various times throughout the morning and into the afternoon. Thursday evening saw us all, new and old, poolside, gathered around the bar where we settled in enjoying a meal and drink and rekindling friendships, some for the first time in 35 years. Friday 25th (Anzac Day) finally arrived. Around thirty brave souls who survived the night before, rose early for Dawn Service at 6.15am. At 9.15am the coach arrived at the Red Centre to transport the guys to the march marshalling area, then returned to pick up the ladies to be dropped off at Anzac Hill where the march would conclude. As the only unit marching it was a great honour to head the parade, an honour that we probably won’t receive again. We were without an officer at the reunion this year, so our parade was ably lead by Peter Finch (1968-69) and Tim Moroney (1967-68). Our banner bearers were Garrick Evans (1968-69) and Harry Ind (1969-70). During the service a wreath was laid on our behalf by Ron Rogers (1966-67 & 1969-70) and Jan Stonehouse, widow of Claude Stonehouse (1969-70) who sadly passed away in late 2001. Following the service we all gathered at the RSL where meals were available and a couple of hours free beer was put on. That evening we gathered back at the resort for a BBQ and some more free beer provided by the Red Centre Resort. Everyone had a fantastic day and the festivities continued till nearly midnight. Saturday 26th we headed out for a tour of Alice Springs. We visited the School of the Air, Royal Flying Doctor Service, Old Telegraph Station, the Reptile Centre and Anzac Hill once more for some photos. We arrived back at 1730hrs in time to prepare ourselves for the main event, the dinner/dance. The function room looked fantastic, crisp white cloths, silver sashed chairs and tables bedecked with candelabra and flickering silver candles. Corps colours splashed across the tables and our banner hung proudly on the wall above the dance floor. As the night went on the dance floor was rarely vacant with the rockers and movers gyrating away to the music of the 60s and 70s, our youth revisited. The evening eventually wound up with a moving bracket including Vera Lynn’s “We’ll meet again”. A fantastic night, thoroughly enjoyed by all !! Sunday 27th saw everyone up and ready to go by 0830hrs for a morning tour of Simpson’s Gap and the Alice Springs Desert Park, then back to the Resort for a lunchtime BBQ by the pool. The afternoon drifted into the late evening with old friendships being cemented, and new ones nurtured. The stories and laughter flowed and the resolve of everyone was to meet again and not let these special reunions fade away. Monday morning saw people preparing to leave, groups gathered at various spots around the resort and farewells were said. Some leaving to go home, others preparing to continue their tours around Australia.